Software for selected pieces. Performance patches in max are available to those who contact the composer. requires max v6.0 or higher and additional libraries (as listed in download “readme” files). Screenshots of these performance patches are provided below. Some sub-patches (Max or Max for Live) are available for immediate download below. 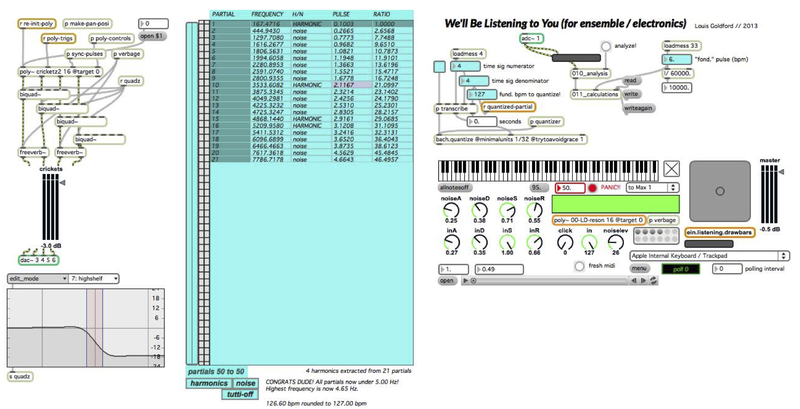 We’ll Be Listening To You (2012) includes an electronics part built on resonant model synthesizers. 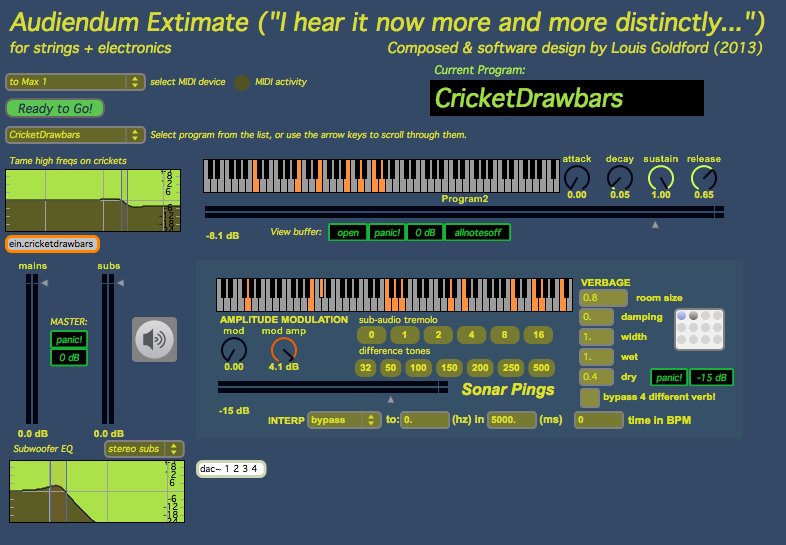 These synths sculpt and reshape the timbres of crickets and a variety of other sound sources, based on previous audio analysis. The computer assistant has the ability to interact visually with the spectrum in a “drawbars” UI for continual reshaping of the sound. The part also includes modules that analyze a sound and convert its frequency components into tempo ratios. This results in the pulsing of crickets according to a complex array of polyrhythms. The patches for Audiendum Extimate are also built on resonant synthesis of crickets in addition to separate synthesizers for other timbres, including those of deep sea sonar simulations. Like We’ll Be Listening To You, this piece includes a “drawbars” interface. “Grand Sepia Taksim” parent patcher. Requires specialized Arduino sensor array to run. Contact the composer for more information. Contains an implementation of ein.ChineseScales, which retunes its input based on precise tuning ratios of the Chinese pentatonic scales in a simple UI. Below are some modules that run inside Curio Box. These are not Max For Live devices. ein.Combinament takes a live spectral snapshot of incoming audio and then turns it into a glassy “tambura,” using four comb filters to continually brush over partials. Requires CNMAT sinusoids~. ein.kanalyzer allows for spectrum-specific amplitude tracking. 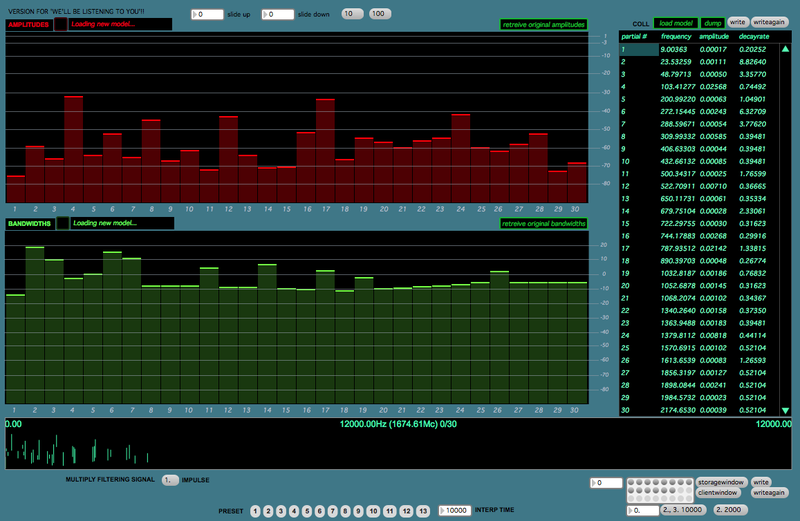 It visually monitors the bark bands of an incoming audio signal (i.e. the live kanjira), outputting bangs for each band. Requires FTM and analyzer~.